Lieutenant James Shelley commands a high-tech squad of soldiers in a rural district within the African Sahel. They hunt insurgents each night on a harrowing patrol, guided by three simple goals: protect civilians, kill the enemy, and stay alive—because in a for-profit war manufactured by the defense industry there can be no cause worth dying for. To keep his soldiers safe, Shelley uses every high-tech asset available to him—but his best weapon is a flawless sense of imminent danger…as if God is with him, whispering warnings in his ear. This is the third of the sword and laser book picks for June I have read. The first two I didn’t finish. But it’s third time lucky. 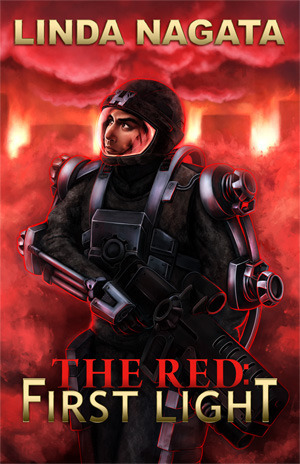 This is military science fiction about tech-enhanced soldiers in the future. The closest to this I have read is Timothy Zahn’s first Cobra series. Fortunately this is hard-SciFi, the story is heavily dependent on the tech and it drives the story forward. That’s not to say that the characters are badly written, they may be a bit stereotypical, but come across a fully rounded characters. The only disappointment was the ‘villain’ of book. There is little explanation of the villain’s motivations and not much to understand. The story is told in first person and keeps going at a good pace. There isn’t too much internal monologue that can slow the story. This is the first of a trilogy, so next is the sequel, ‘The Trials’. Recommended.